Big George's has been a family owned business since 1959, providing our customers with the highest quality products, the best possible service and prices to fit every budget. When you come to Big George's, our friendly and knowledgeable staff will guide you through the area's largest selection of Appliances, Home Theater Systems, Fireplaces and Outdoor Cooking. We invite you to visit our showroom for the best deals in the area, whether you're looking to replace a necessity or make the leap to high-end luxury, you will find exactly what you want at Big George's, with selection and value that will keep everyone in your family coming back for years to come! Our new Ann Arbor showroom opened in June 2007, was constructed with an eco-friendly 'green roof'. 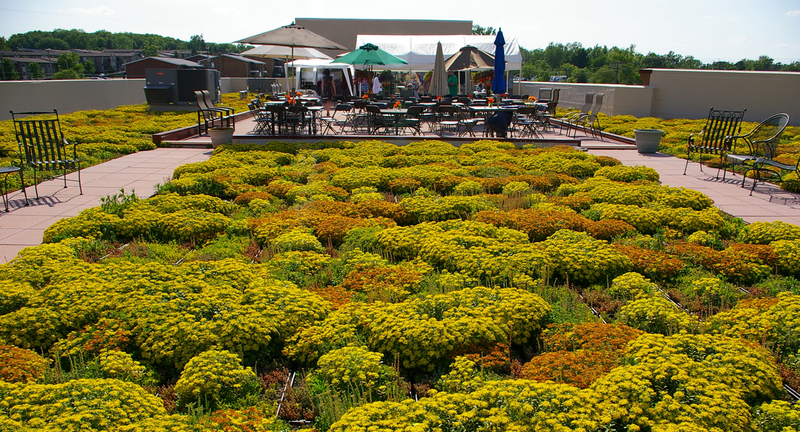 Our green roof helps us conserve energy and reduce our company's carbon footprint on the environment. Utilizing our roof space in this manner is not only an environmentally smart choice, but an economically smart one as well, saving our company energy costs in the long run. Our commitment to the environment doesn’t end here. We are a major retailer of E-Star products. • Protect conventional roofing systems, typically doubling the service life of the underlying waterproofing membrane. Our green rooftop terrace has played host to many social events from local political rallies to professional speaking engagements to The Women's Realtor League Of Michigan to old fashioned Michigan Wolverine Football Tailgate BBQ's. Big George's Green Roof is also ideal for like-minded business groups to host meetings, private functions or luncheons. This green oasis features the green roof with live greenery and an outdoor deck that provides a great view of the new Stadium Blvd, which makes it the perfect background for any social gathering.